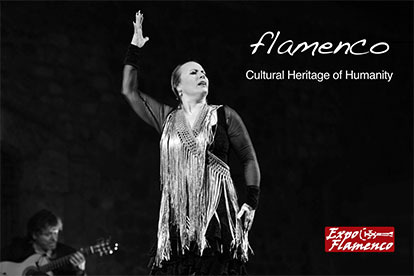 Several years ago, people could say (and they did) that she was flamenco’s revelation. No one expected such a young cantaora to break through so strongly in our days, being requested by all types of venues of cante jondo: peñas, summer festivals, theaters and international events. 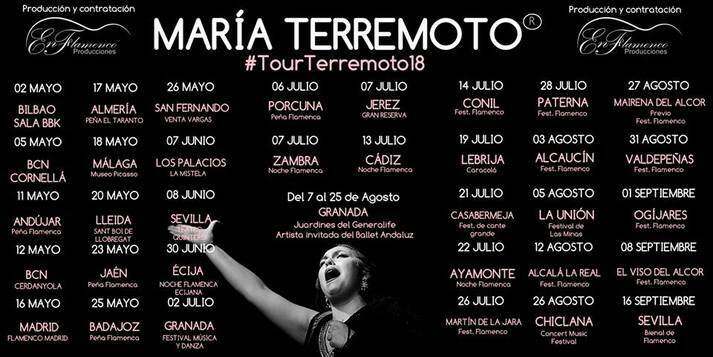 María Terremoto, daughter of the late and greatly missed Fernando, has a hectic schedule all the way to the end of summer, ending the season with her performance at the Bienal de Sevilla on September 16. It was the Bienal itself which awarded this cantaora the “Giraldillo” Revelation Prize in it’s 2016 edition, a perfect launching pad for her upcoming success. Just in May, she’ll be performing at eleven different shows, in venues such as Peña El Taranto in Almería, and at Venta de Vargas in San Fernando, as well as in big cities such as Madrid and Barcelona. 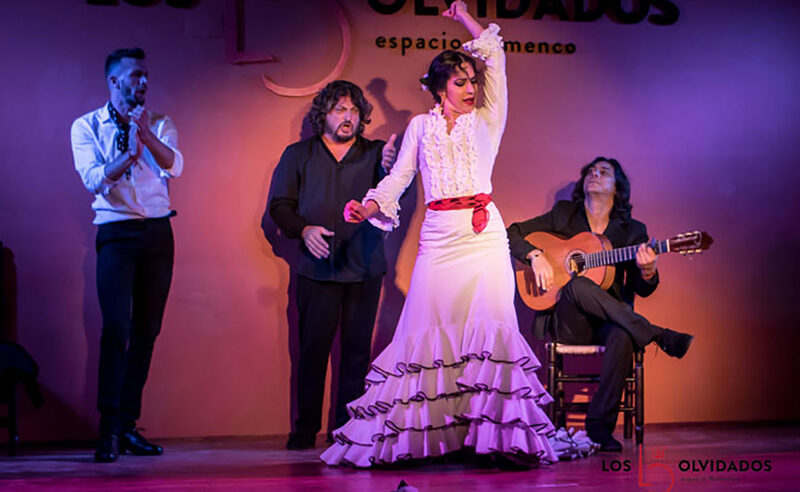 It’s clear that Jerez has now another flamenco reality, an artist that is starting to achieve renown, but who has already revealed her unique stamp, her extreme talent and her ability to connect with the public. 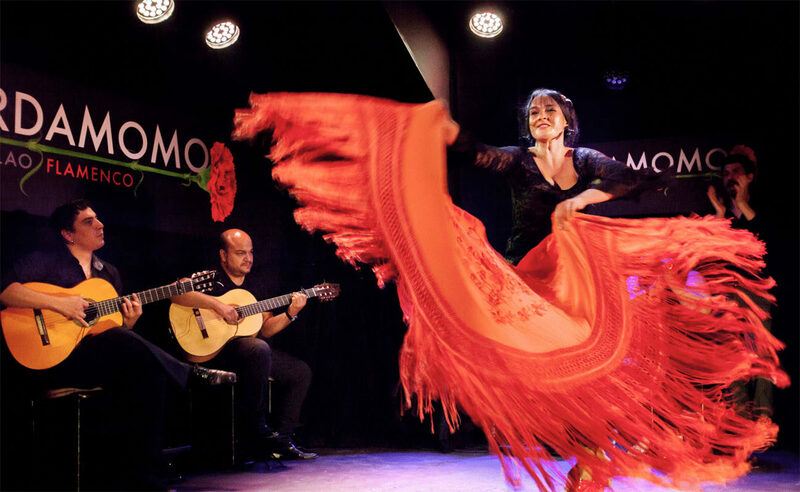 Having a Gypsy style, she greatly succeeded in the last edition of the Festival de Jerez, filling up the Gonzáles Byass venue to capacity and reaping the acclaim of its public. María, who has matured in life after suffering many loses, such as that of her own father, her grandfather Antonio Benítez and, more recently, her grandmother María Márquez, has shown with every performance and increased self-confidence and a firm command of the stage, expressing, above all, joy and happiness for “the amount of work I’ve got for these months”, stating that “it’s a privilege, for me and all those around me, that so many prestigious festivals are intent in featuring us”. This cantaora also expressed a “total commitment” for what will be her first album, working on it with “high hopes” and spending “many hours, day and night” on it. 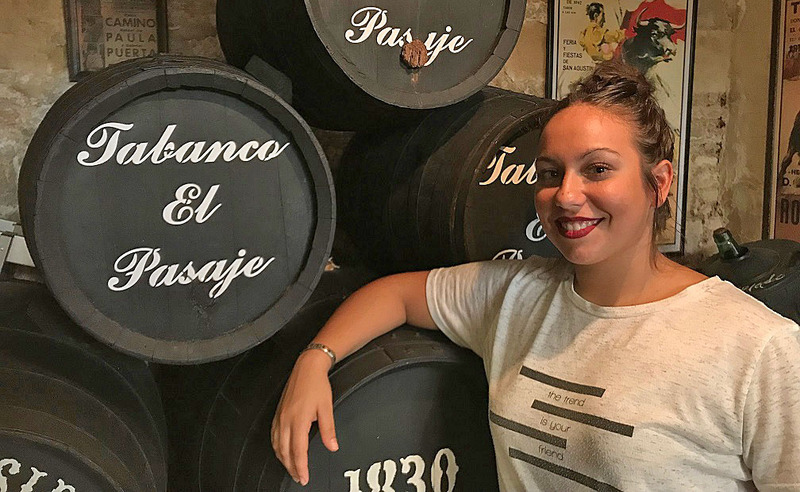 Among the performances that this artist from Jerez (well-rooted in Seville) highlights as the most relevant are the ones at the Caracolá de Lebrija, the Festival de Casabermejas and the Festival ‘Jerez, Gran Reserva’, all three scheduled for the month of July. 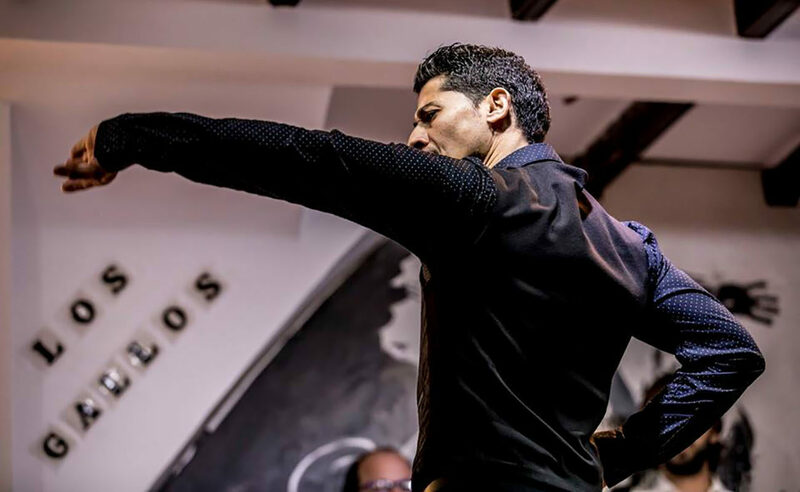 This doesn’t mean that she thinks any less of all her other performances, because, according to her, “in every corner of the world we must give it all, because flamenco must be conveyed with intensity, and I have the greatest respect for my public”. August will also be a very busy month for María. Suffice to say that she will take part in the Festival de las Minas de la Unión and the Concert Music de Chiclana, two events with extensive media coverage. Regarding her performance in Jerez, on July 7, at the city’s Plaza de Toros (bullfighting ring), she’ll approach it with “great responsibility, because singing in our own town creates the highest expectations, although it’s also a great joy, because it’s a superb lineup and it’s important to fill up the venue to experience an unforgettable evening with so many high-level colleagues, elite artists”. 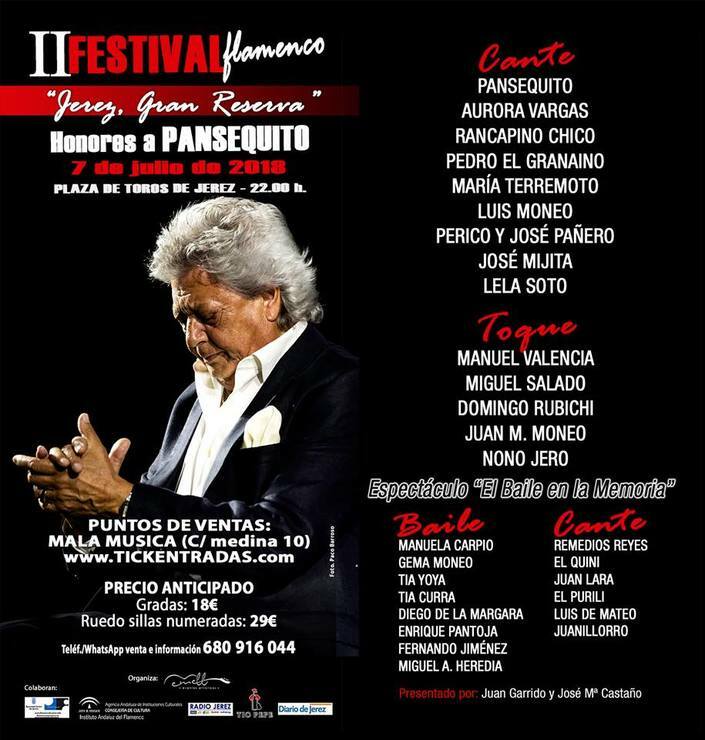 This festival, which will feature artists of stature of Aurora Vargas, Luis Moneo, the Pañero brothers, Pedro El Granaíno, Rancapino Chico, José Mijita and Lela Soto, will honor Pansequito, “a master of cante who has left, and is still leaving, a great legacy so that young artists like me continue to learn, listening to him”, adding that “this tribute in Jerez is very well deserved, because there are no longer artists with such a distinguished career and high artistic quality”.